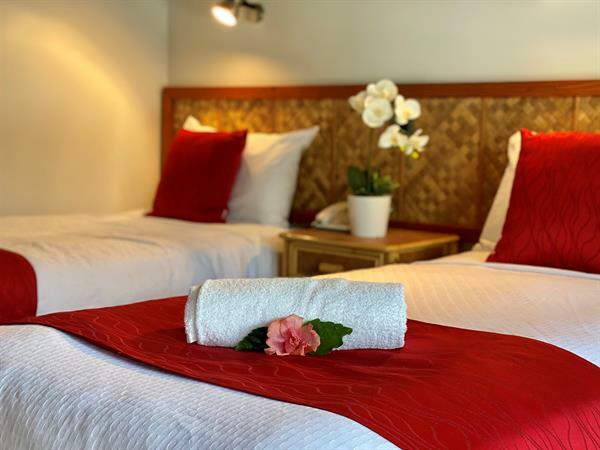 Our one stand alone Twin Villa features a bedroom area with two single beds and an ensuite with shower - making it the perfect accommodation for two friends travelling together. The living area has a TV and a fully-equipped kitchen for your comfort and convenience. The other garden villas are equipped with a queen or king bed. Smart flat screen TV, Air Conditioning. (Satellite/Sky TV IN LOBBY), telephone, WiFi Internet access, seperate bathroom with shower. hairdryer.Radio/alarm clock, optional child's bed, sliding windows that can be opened onto a terrace, gardenview, seating, kitchen, iron/ironboard, wake up service. Housekeeping daily room service. seperate bathroom. 24 hour desk.